i don’t know how to start this post – or finish it. this past week has been really…draining…attempting to process and work through thoughts and memories – it’s all just left me a little dim. 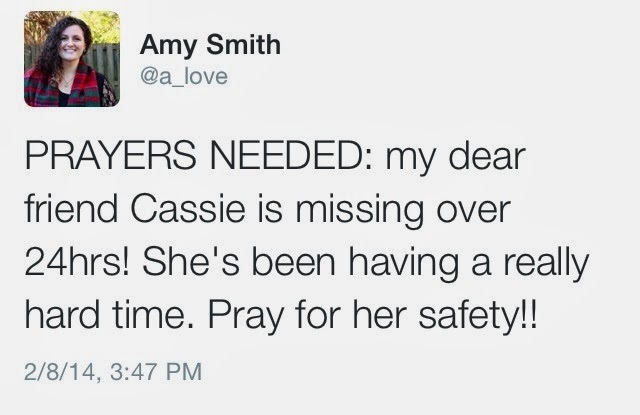 my sweet friend Cassie had gone missing. i had been out of the house all day saturday and wasn’t checking facebook so when my phone lit up with a “is cassie missing?” text i stood still. what? – no – this can’t be. sure enough i text some of my friends trying to find out what was happening – trying to locate cassie. this couldn’t be real. this only happens in movies. your friends don’t go missing. i sat there and poured over her facebook, looking for any clues to where she might be. i kept seeing new comments with “where are you?” “maybe you just needed to take a day to unwind” “come home you’re loved”. i kept checking my phone waiting for an update, for anything, for some sliver of good news. what seemed like an eternity later. don’t say anything on FB – they found her – she’s gone. i sat there in silence. tears welling up in my eyes. no – no this isn’t right. she’s fine – she is fine – she. is. fine. after a few more conversations more things started to reveal themselves. i never really know how serious this depression was. i didn’t know how many women took their own lives because of it. i didn’t know the internal struggle these women face. i had no idea cassie was wrestling through all of it. i’m not going to sit here and say in the last few years cassie & i were best BEST friends. in high school though – she was one of my best friends. she helped me through my moms passing, she was always a light, we had many hilarious and in depth conversations ranging anywhere from religion to bugs to art. i can not express the impact she left on my life. how HER life changed mine. since high school we’ve kept in touch and seen each other. we checked in and chatted, like no time had passed, and i still held her close to my heart. Cassie was a beautiful woman. she was a ray of sunshine. so incredibly joyful and full of encouragement. she was one of the happiest individuals i’ve had the privilege of knowing. her visitation was wednesday night, and her funeral was yesterday. it was so heart breaking. it was heart breaking to see her family so broken. to see her husband with his hand constantly on her casket. to see her friends in tears, friends i haven’t seen in a few years. it was a torn feeling. i’m normally pretty strong when it comes to death and funerals. i have a different view than most and have experienced pain and hurt at an early age. but after speaking to her husband i had to go out for air. i couldn’t get rid of the lump in my throat. my sweet friend, full of joy, Cassie took her own life. and i was surrounded by people who loved and missed her. she is leaving behind a husband, family, and a young son. bronson, her son, is facing medical issues. i’ve been sharing on twitter, and facebook a link to a fundraising campaign Cassie set up before taking her own life. i talked to cassie after she set up the fundraising…she was telling me how she didn’t get out much recently, i told her i was going to come visit, and just a few short days later she was gone. i just can’t wrap my head around it. the small good that has come out of this? they have surpassed their goal. but they still need more. here is a link to her fundraising page: BRONSON THE BRAVE! please consider donating, please consider praying for them, please consider passing this link along on twitter, facebook, blog land. coming from one friend to another – life is precious, cassie’s life was precious, and i want her memory honored in the best possible way. to read more about a recent 2013 study on PPD click here. to learn about symptoms, treatment options, etc for PPD click here. if you, or someone you know is struggling with depression of ANY form please reach out for help. you can shoot me an email, you can go to your friends, to a minister, to any church, to a doctors office, to a clinic – anywhere. PLEASE reach out and ask for some help. it doesn’t make you weak, it doesn’t make you any less of a mother, woman, brother, father, wife, friend, son, daughter…it makes you a beautiful human being who needs some encouragement and help along the way. i miss my beautiful, artistic, loving, joyful friend. 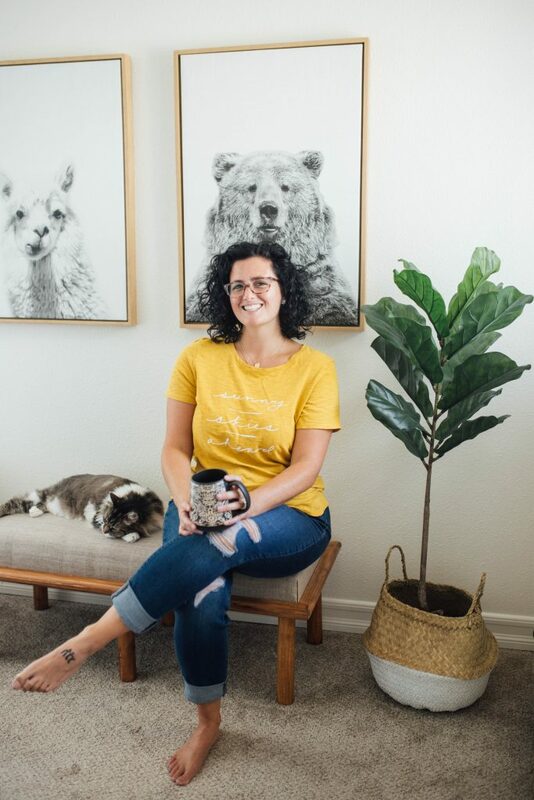 Next postmonday | lists & cats.